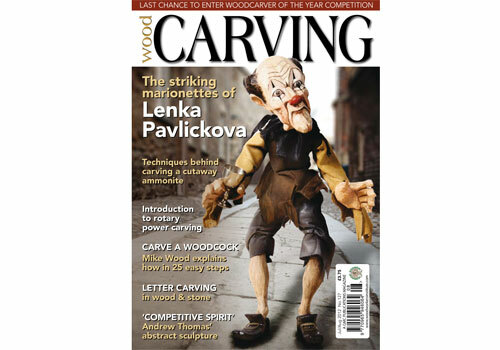 In Issue 127 of Woodcarving Miriam Bentham meets Lenka Pavlickova, a fascinating Czech marionette maker. Michael Painter tackles the problem of sculptures holding inserts, and following on from last month's goshawk, Mike Wood shows you how to carve and paint a woodcock. Andrew Thomas gets into the competitive spirit with an abstract podium winners sculpture, Andy Hibbert takes you through letter carving in detail, and Peter Benson demystifies the process of sharpening tools. Steve Bisco creates a classical baroque piece with 'putti' (often mistaken for cherubs! ), and John Francklow conjures up the distant past with a carved ammonite. Plus the art of carving, power carving, and more! We catch up with Carrie Carmann to find out what inspires her work for this month's '20 minutes with', and Ben Hawthorne considers the importance of teaching his grandson some basic facts about wood. We'll also visit another carving club, and bring you the latest news and reviews from the world of carving. On test this month, we put the Mastercarver Micro-Pro through its paces, as well as the Skil Multiscraper, plus The Carver's Toolbag where we give a roundup of all the latest tools and products specially selected to meet your carving needs. Another great issue, so don't miss out on yours! If you would like to subscribe to the magazine then click here for details.